Geothermal surface features provide a tangible example of the amazing processes occurring underneath our feet. Surface features include geysers, mud pools, hot springs and pools, fumaroles and hot ground. Geothermal surface features are an increasingly rare occurrence all over the world, but are relatively abundant in parts of the Bay of Plenty, such as Rotorua. 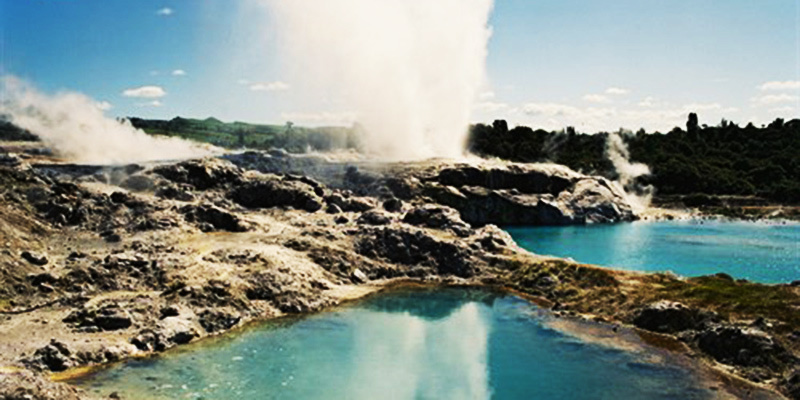 The Rotorua system is world-renowned for its features and we are fortunate to have so many different types. Many of the internationally significant surface features in the region are located within 20 kilometres of Rotorua city centre (which includes those at Whakarewarewa Valley, Kuirau Park, Waimangu Valley and Tikitere). However, there are also notable surface features at Kawerau, Lake Rotoehu, on Moutohorā Island, Whakaari/White Island and in other locations at a smaller scale. To find out more about some of the great geothermal surface features to visit in the Bay of Plenty check out the Destination Rotorua webpage. Bay of Plenty Regional Council has prepared Guidelines for Mapping and Monitoring Surface Features with the assistance of geothermal surface feature experts throughout New Zealand. This sets out a methodology we hope will become the standardised way of mapping and monitoring for surface features throughout New Zealand. Download a field sheet Geothermal Feature Survey Form from the mapping and monitoring guidelines. Rising mud Rotorua geothermal area. Waimangu geothermal area vegetable plant. Geothermal surface features in New Zealand are hydrothermal in nature (water or steam dominated) with most groupings having gradational boundaries. The surface features range from those that are in high energy states (fluid or steam), through over-flowing to non-over-flowing pools (lower energy). The classification table of the main types of surface features below has been developed for the Regional Policy Statement. Because surface features are so rare on a global scale, it is important we protect them for the future. Many features are fragile and easily damaged. They can change due to natural causes, such as weather patterns, climate changes, or earthquake and volcanic activity. They can also change due to human activities, such as nearby extraction of energy and fluid. One such example of the effects of use on surface features is in Rotorua. During the past 100-plus years, with the exception of eruptions, the impact of humans has been vastly greater than that of natural change. Traditional Maori activities caused only minimal disturbance. Greater human impact on geothermal features began early in the 20th century, when outflows were channelled and wells were drilled to help meet the demands for hot water for bathing and heating. Geothermal surface features can also be hazardous. Boiling pools can cause thermal burns and even death. Concentrations of toxic chemicals (like mercury and arsenic) and toxic or asphyxiant gases (hydrogen sulphide, carbon dioxide) are also hazardous. Some systems may also have the potential for hydrothermal eruptions. If you wish to undertake any activity such as building works or earthworks near a surface feature you may require a resource consent from us and/or the relevant district council.